Rotherham's Chantry Brewery has named a new beer in honour of glass bottle manufacturer Beatson Clark, one of the oldest businesses in the town. Chantry Brewery began producing quality real ale in 2012 after significant investment in the latest brewing technology installed at its Parkgate facility. It has recently launched Teaser, a 4.5% pale ale brewed with Bravo USA hops. 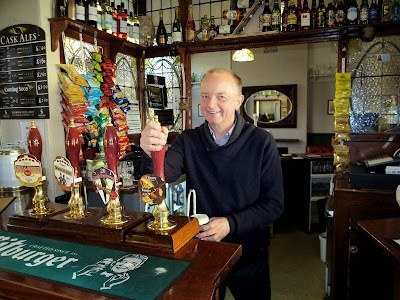 Tim Swetnam, technical and environmental manager at Beatson Clark (pictured at the Cutler's Arms in Rotherham), noticed that the names of the beers focused on Rotherham's steel heritage, with brews called Women of Steel, Kaldo and 18 Eight – a grade of stainless steel. The idea for Chantry Brewery came about when Mick and Kevin Warburton, who worked in the steel industry for many years, and their friend Sean Page saw an opportunity to bring brewing to their home town of Rotherham. "I suggested to Sean Page from Chantry that he brew a glass-themed beer for Beatson Clark," said Tim. "We discussed what style of beer I like and what I thought it should be called. I suggested Teaser, which has a double meaning: the beer teases the palate but a teaser is also the original name given to the furnace man in the glassworks centuries ago. "Three weeks ago they told us they were brewing the new beer and invited us to go to the brewery and take a look." Beatson Clark furnace operator Max Elliott features on the pump clip for the beer, which is being sold in Chantry Brewery’s three pubs in South Yorkshire. "The beer is delicious, a stronger than average hoppy pale ale, and we're very proud of the association with this fantastic local brewery," said Tim. Mick Warburton, co-owner at Chantry Brewery added: "Everyone in Rotherham is proud of Beatson Clark with its 250-year history. Tim is fan of our beer and when he asked if we could name one after Beatson Clark we were more than happy to oblige. "We thought it fitting that Tim named it and brewed it to his taste – a nice hoppy session beer to quench the thirst of a glass maker, but with a bit more bite! "The beer has proved very popular in the area. It's being sold in over 30 local pubs and more than 4,000 pints of it have been drunk already." Beatson Clark has close associations with the brewing industry and manufactures beer bottles for several breweries, including Meantime, Robinsons and Brooklyn Brewery in New York.